This entry was posted in Pictures and tagged Bible, bird, fed, Matthew, worthy. In Revelation 3:15-16 God says that He does not like ‘lukewarm’ Christians. He wants them to either be ‘hot’ or ‘cold’. He says that if they are ‘lukewarm’ He will spit them out of His mouth. Imagine a fence down the middle of two different areas. On one side is dead, dried up grass, and on the other is green grass. Now imagine someone sitting on that fence. God doesn’t want us to be ‘on the fence’ about what we believe. He wants us to either believe strongly and whole-heartedly, or believe half-heartedly. He would rather us believe half-heartedly than be in-between. But, of course, He would prefer if we believed strongly and whole-heartedly. Not only does He not like ‘lukewarm’ Christians, but He also doesn’t like two-faced Christians: people who claim to be Christians but act two different ways depending on who they are with. In James 3:10-12 James, the brother of Jesus, tells us that praise and cursing should not come out of the same mouth. He compares that to a grapevine producing figs and a fig tree producing olives. It’s just not possible. He says that a salt spring cannot produce fresh water. We shouldn’t be two-faced. We shouldn’t be Christ like around some people and worldly around others. Good and bad should not be spoken from the same mouth. The worst would be a two-faced, lukewarm Christian. God would surely disapprove of that person. So if you are a Christian, act like one consistently. Don’t change how you act based on who you are around. Also, be strong in your beliefs. A consistent Christian strong in their beliefs pleases the Lord. This entry was posted in Devotions and tagged believe, Bible, Christian, cold, God, hot, James, lukewarm, Revelation, two-faced. 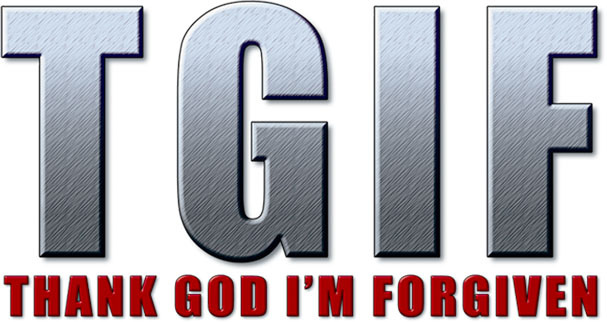 This entry was posted in Pictures and tagged acronym, forgiven, tgif, thank God, thankful. In the Old Testament people had to make sacrifices when they sinned. Hebrews 9:22 says “In fact, the law requires that nearly everything be cleansed with blood, and without the shedding of blood there is no forgiveness.” In order to be forgiven, they had to sacrifice an animal, typically a lamb. This was before Jesus came. Jesus was sent to be the ultimate sacrifice. His blood was shed to cover over the sins of the world: past, present, and future. In John 1:29 John refers to Jesus as “the Lamb of God who takes away the sin of the world”. Jesus is called the Lamb of God because He was sent by God to be sacrificed like a lamb. He was perfect and had never sinned, but He took on the sin of the world so that there could be eternal forgiveness without any more bloodshed. He was innocent, just as the lambs who were sacrificed before were. A lamb is also like Jesus because they are both peaceful. Sheep are not violent, and neither was Jesus. Jesus’ death on the cross as the Lamb of God was foreshadowed in Genesis 22, the story where Abraham is prepared to sacrifice his only son Isaac. God asked him to do this and, without hesitation, Abraham agreed. Later on, when he and his son were going to the mountain to make the sacrifice, Isaac asked where the lamb for the sacrifice was. Abraham told him that God would provide the lamb. This foreshadowed God sending His only Son to die as a sacrifice. Before Abraham could sacrifice his son, and angel told him not to. The angel said that he knows now that Abraham loves the Lord since he did not withhold even his only son. Just as God later showed His love for us by not withholding His only Son. Now we no longer have to sacrifice a lamb when we sin (if we did, sheep would be endangered or even extinct!) because Jesus, the Lamb of God, was sacrificed for our sins. Because of this, we can be forgiven. This entry was posted in Devotions and tagged Abraham, blood, forgiveness, God, Isaac, Jesus, lamb, Lamb of God, sacrifice, sin. 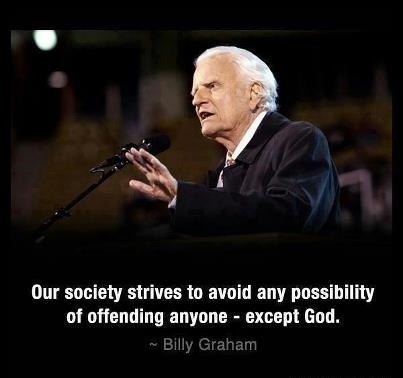 This entry was posted in Pictures, Quotes and tagged Billy Graham, God, offensive, picture, quote, society. Exodus 20:3-17 is where God lays out the ten commandments for us. A lot has changed since then, but these commandments still remain and they are still just as important as they were then. Some of them are a little difficult to understand, or maybe they just seem like they don’t make sense in this time. However, God intended for these commandments to be simple to know, and simple to remember. Even though they aren’t always simple to follow. The first commandment is that we should have no other gods before God. That means that God should be our one and only. We shouldn’t worship God and another god. God says that He is a jealous God in the sense that He does not like it when we worship another god, too. The second commandment is that we should have no idols. That means that there should be nothing and nobody that we love more than God. So we shouldn’t have statues that we worship, and we also shouldn’t have humans that we worship. The third commandment is that we should not take the Lord’s name in vain. That means we shouldn’t say things like ‘Oh, my God!’ I know that for most people it’s something they are used to saying and they don’t mean any harm or disrespect to come from it but, remember, saying things like that is a direct violation of the third commandment. The fourth commandment is to remember the Sabbath day by keeping it holy. The Sabbath day is Sunday. So every Sunday we are to rest just as God rested on the seventh day. That’s a commandment that we should be happy to obey! The fifth commandment is one most of us know and most of us don’t like: honor your mother and father. Let me tell you, it’s not always easy. But that is what God asks us to do, and He asks us to do it because He knows it’s for our own good. The sixth commandment is that we shouldn’t murder. That’s pretty straightforward. In my opinion, that’s the easiest commandment to obey. Lots of people go their whole lives without murdering someone. God does not condone violence of any kind, especially not murder. The seventh commandment is that we shouldn’t commit adultery. That typically means that, if you are married, you should not cheat on your spouse. However, in Matthew 5:28, Jesus says that just looking lustfully at someone is committing adultery with them in your heart. The eighth commandment is that we shouldn’t steal. That’s pretty understandable. The ninth commandment is that you should not bear false testimony against your neighbor. Put simply, don’t lie or spread rumors. Finally, the tenth commandment is that we should not covet. Which means that we should not want what belongs to another person; we should not be jealous of what another person has. That could be something as simple as not being jealous of all the things they have that you don’t have, or something as big as coveting their spouse or their boyfriend/girlfriend. Overall the ten commandments are a list of things we should or shouldn’t do. God purposefully worded them simply so that we wouldn’t be confused by them. And He knows we aren’t perfect. He knows that, throughout our lifetime, Christians will probably disobey most of the ten commandments. But He will forgive us and He will continue to love us. He just gives us these commandments to help make us better Christians, better people in general, so that we can live a better life. They are there to help us and guide us. And God is there, too. This entry was posted in Devotions and tagged Bible, commandments, Exodus, God, love, obey, should, shouldn't, simple, the ten commandments.